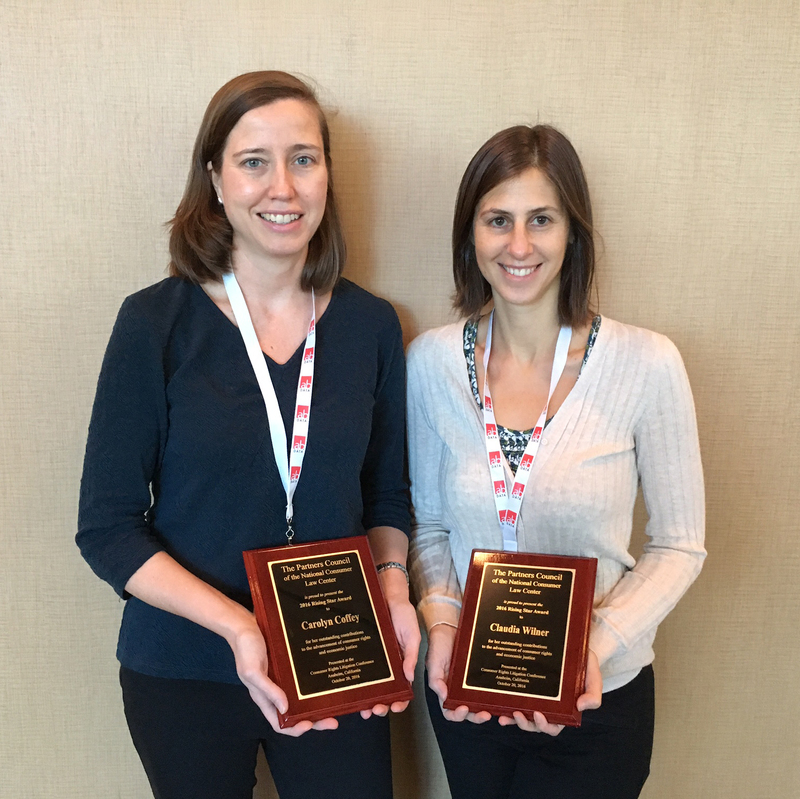 NCLEJ Senior Attorney Claudia Wilner (photo right) has been recognized for her outstanding work by the National Consumer Law Center with its 2016 Rising Star award. The award honors attorneys who made major contributions to consumer law by trying or settling a case of great success and significance. Ms. Wilner was honored along with Carolyn Coffey of MFY Legal Services for their work on the landmark case Sykes v. Mel S. Harris & Associates, which challenged widespread abusive debt collection practices in the New York State courts. Abusive debt collection practices are a scourge among low-income populations, targeting the most vulnerable people and largely impacting communities of color. Debt collectors often fail to serve notices of lawsuits, so that people are unaware of the legal proceedings against them. When these people do not show up in court, the debt collectors will almost always win a default judgment against them. Ms. Wilner and Ms. Coffey helped to secure a settlement, which returned approximately $60 million to low-income people in New York State whose bank accounts were seized or wages garnished and extinguished more than $1 billion in alleged debt. In addition, the New York State courts are expected to vacate nearly 200,000 fraudulently-obtained default judgments. NCLEJ is of counsel to New Economy Project, which brought the litigation along with MFY Legal Services and Emery, Celli, Brinckerhoff & Abady.